Most of the time, in situations like this, you don’t find anything worth saving. I was down in New York, visiting my mom at her assisted living facility. She and my dad moved there eight or nine years ago. He has since passed, but she is still chugging along, as best as one can chug at 92 ½.
I was looking through a box in her closet when I came upon a letter, written by my dad to his sister. 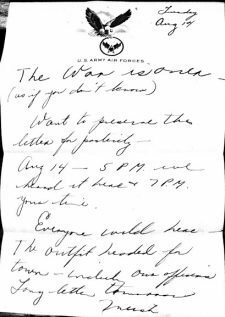 It was dated Tuesday, August 14, 1945 and written on U.S. Army Air Force stationary. The war is over (as if you didn’t know). Want to preserve this letter for posterity. August 14 – 5 P.M. we heard it here & 7 P.M. your time. Everyone wild here – the outfit headed for town – including our officers. Like I said, most of the time you don’t find anything worth saving – this was the exception. First, because it was just plain cool to hear what my dad sounded like as a 24-year-old. Second, because it’s tied to a huge event – the official end of WWII. And while not quite a Dead Sea Scrolls level of discovery, it still feels like I unearthed a little piece of history. When written, it was completely unremarkable. Just a letter home from some kid in the army. You’ll be pleased to know that when it comes to selling a professional service, the best marketing works the same way (and it doesn’t take 73 years). This past week, I was rehired by two different former clients. One from five or six years ago; one from it’s been so long I don’t even remember. … they reached out to me. … there was zero discussion about my experience or qualifications. … my “proposal” consisted of a few casual emails back and forth. I hope you’ll agree that when it comes to getting hired, that’s about as good as it gets. Well, partly because I am so good looking, of course. But I have a more reality-based theory: It’s because I’ve stayed visible to them. They subscribe to this newsletter. I’m active on LinkedIn. I send things via snail mail. I get together for coffee. I reach out with an occasional email to say hello. First, none of these activities, individually, makes any difference. By themselves, they are the marketing equivalent of a letter home scrawled on a random piece of paper. Nothing memorable, nothing worth talking about. But taken together, over time, they are huge. It’s their cumulative effect that matters. Second, in all cases, I’m not trying to sell anything, today. And yet, in all cases, I’m trying to sell something, tomorrow. It’s a long term play. Like my dad’s letter, the value grows over time. … I want you to hire me in three years. After you’ve checked me out. After you’ve seen me pop up on your LinkedIn feed 50 times. But what about capability and selling skills and elevator statements and persuasive web sites and proposals that move prospects to take immediate action? All fine and good. But guess what? The better I know you, the less any of that matters. Particularly if it’s a past, happy client. At that point, it’s just a simple back and forth between friends, trying to figure out if we’ve got a match. Bottom line. There’s an old saying that goes, “The best time to plant a tree is five years ago.” It’s clever, but if you need shade today, it’s kind of annoying. It’s the same with marketing. If you need clients right away, all this slow burn relationship building stuff is not the first place to look. That said, if you plan to still be around in three or five or twenty years, it might not be such a bad idea to drop some seeds right now. I know that’s what my dad would do. Are you still chugging along? Explain. What’s your favorite “stay in touch” activity for past clients? I heard from an old client last month (from 3 or 4 years ago) who took a new job where she was tasked with creating all new collateral material for the bank: brochures, website copy, blogs, you name it. She told her boss “I know just the guy for this” — guess who that was? I’m in the middle of rewriting all their brochures now and also starting writing their weekly blog. This is shaping up to be one of if not my biggest clients! 1. I am indeed chugging along. Went for a brisk walk this morning with fellow Blue Penguin acolyte Stacey Shipman! 2. Wow indeed on your Dad’s letter. My “wow” moment this week was at the movies. I went to see “A Star is Born” on $5 movie Tuesday. In the last scene of the movie, the female lead played by Lady Gaga performs a song. And for a moment….. I forgot I was at the movies. When the credits started rolling I was jolted back to reality and said “Wow”. As did a few people sitting near me. Go see it on the big screen if you haven’t already! 3. Email newsletter with my free monthly book giveaway, lunches and coffees. 1. I love having acolytes (assuming groupies are out of the question). 2. Great movie. For a less great but nonetheless intriguing-now-that-you’ve-seen-this-one, watch the 1976 version of the movie. Interesting to see what they kept and what they changed! 3. I read every one. Nice story. And solid advice. I took the challenge and did that google search “penguins love marketing communications” and guess what? It worked, just like yoy said (1st result right under the paid ad for someone else). Ha,ha, glad it worked, Eric! 1) I’m still chugging but with a brand new business. Hoping to take all I learned in my past businesses and create something successful with this one. Brand new starts are invigorating and kind of scary, but so far, so good. 2) What a really cool letter to find. Wow, indeed. Lots of mixed emotions, I’m sure. It’s the unexpected and beautiful things that wow me these days – a piece of music, something in nature, a nice glass of wine, artwork. 3) Email marketing is, by far, my favorite marketing. I asked my old e-newsletter list folks if they wanted to go with me to the new list for my new job. My best and favorite clients did. It’s because we had built a relationship. They weren’t just clients; they were friends. One told me that she knew I’d do a good job whatever I did, so she became one of my first new clients. Congrats on the new adventure, Dawn! Your site looks great. Thanks so much! And thank you for your early support. That book you sent meant a lot to me. Hope you are well. 2) German Shepherds. I’m definitely a Shepherd girl, and seeing a gorgeous, genius GSD will stop me in my tracks every time.